In the background, there is a road sign with two red lights on and a yellow "symbol". What does it mean? Looks like a "Temporary lane closure". The situation in Winchester, you referred to, supports this. It means both lanes closed. It is one of the options for the British motorway variable signs, see the official highway code pages for more details. but the descriptive text covers this combination. If I'm correct, that sign appeared on a Northbound Entry slip road (on ramp for US readers) to the M3 motorway to indicate that the entire slip road was closed temporarily. I can't now remember the exact cause but I suspect a major accident. 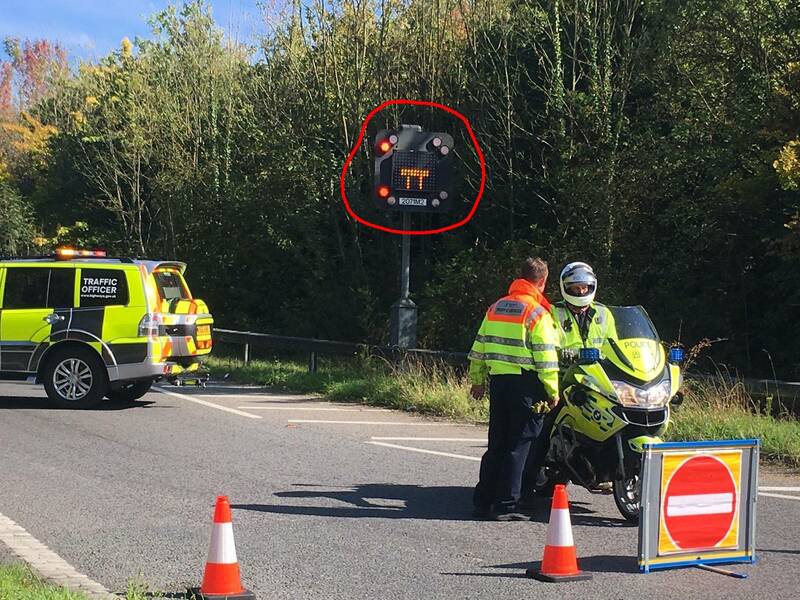 Normally these matrix signs indicate temporary speed limits, single lane closures, etc, but in this case owing to the severe nature of the problem, both lanes of the two-lane road were closed. Nobody here has commented on the significance of the red lights yet, which are fairly key to the meaning. There's a difference that can be used to tell apart amber lights (which warn of a hazard) and red lights (which close the motorway and can't be proceeded past): there are four lights of each colour, and for each colour the flashing is done by alternating between lighting two lights and the other two lights, but for amber lights the top two lights alternate with the bottom two lights (flashing "up and down"), and for red lights the left two lights alternate with the right two lights (flashing "left and right"). Even if there's doubt about the colour (cameras and computer screens can cause trouble sometimes), we can easily see that two lights on the same side are lit in the photo, meaning that they must be red. Now, a "blank sign with red lights flashing around it", especially when it's something as uncommon as a full closure of a motorway or a motorway slip road, has obvious problems with people not knowing what it means. As such, fairly recently, the sign was adjusted to place something on the matrix display as well: this is an "all lanes closed" sign (which is derived from the "various lane closures" sign that @rolinger shows in that answer, but is not the same thing, as it uses red lights rather than amber). The intention was presumably that people who didn't know what the sign for a full motorway closure looks like, but did know what the sign for a lane closure looks like, could figure out the former by analogy with the latter (and it seems to have worked in the case of @rolinger's answer!). As a side note, there are two different sorts of lane closure signs: the T-shaped ones with amber lights are a warning ("the lane will be closed, get out of it"), and there's also a mandatory/legally binding version which uses a red X ("the lane is closed, do not pass this sign in that lane"), together with the traditional red lights. 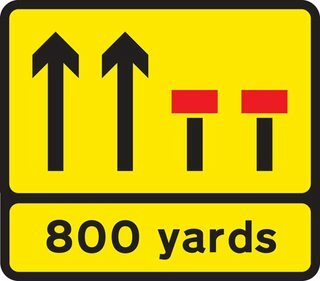 However, only a small proportion of motorway matrix signs are actually physically capable of drawing the red X. 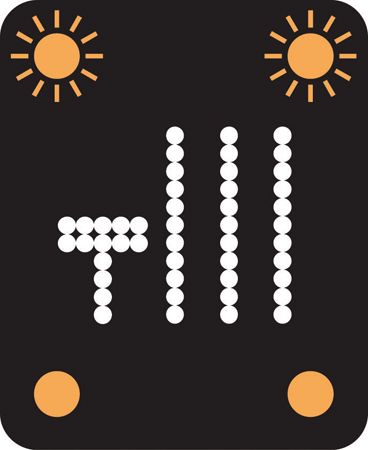 As such, on older or smaller signs which don't have an appropriate display, only the T-shaped display is available for both situations, and the warning versus do-not-pass status is specified purely using the colour of the surrounding lights (if it's amber, it's not an emergency if you're in the wrong lane, if it's red, you'd better not be in the closed lane). In the case where all lanes are closed, though, you don't have any open lanes to move into, and so even people who miss the significance of the colour of the lights (like almost all the discussion in this thread so far seems to have done: only comments by @Bristol and @AndrewLeach point it out) are likely to realise that passing the sign will be a bad idea. So even though the change to add the TT symbol to the sign has caused some amount of confusion between two signs, motorists will still end up doing the right thing (which was presumably the goal of the change in the first place). You are on, or approaching a dual carriage way (2 lanes of traffic in your direction). and BOTH lanes are closed. This is re-iterated by the popup sign in the foreground - a red circle with a white line through, which means "No Entry"
Not the answer you're looking for? Browse other questions tagged uk legal identify-this road-signs or ask your own question. Is there a website or resource that lists specific traffic rules or specific signs for each country? What are the rules to be aware of on a road with a sign that indicates rocks might fall? What does this traffic sign with a crossed-out black octagon mean? What is the symbol on a worker ahead sign? “Give way” on prohibition sign, what does it mean? What does red painted bus stop mean in UK? What does the Apple Command key symbol (⌘) mean on Icelandic road signs? What's the meaning of the sign “Broken white line only marks the centre of the road”?